When Ian McGregor approaches a backyard project, he does all he can to embrace the entire environment. In doing so for this project, he created connections between existing indoor spaces and new outdoor rooms that echo familiar functions while injecting dashes of fun. 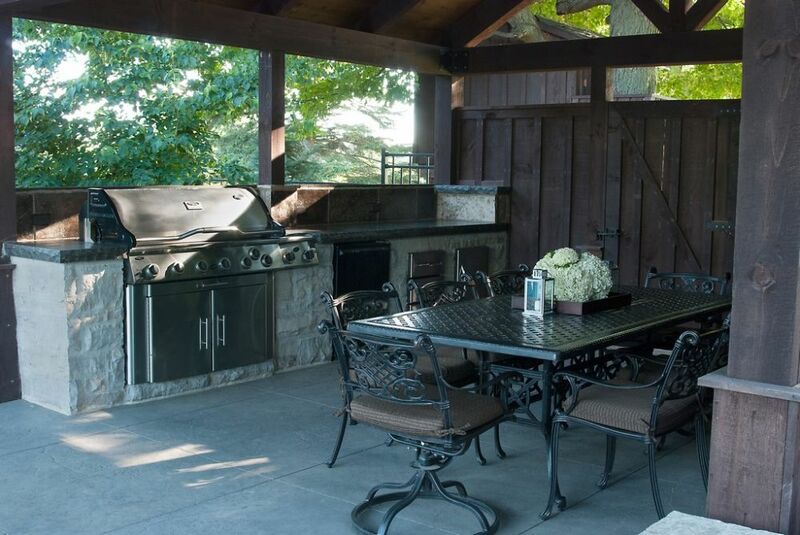 The modern concept of “outdoor living” took hold a long time ago – the very first time a homeowner set up a barbecue grill somewhere near the backyard pool, then figured out a way to enjoy a family meal al fresco. This sort of casual and mostly seasonal approach held on for decades, but approaches to outdoor living took a giant leap forward in the 1990s, when swimming pools started being joined in increasing numbers of backyards by complete outdoor kitchens, large fireplaces and fire pits, dining areas and swim-up bars. Now it’s reached a point where there are even complete outdoor offices with wifi and computer hookups so a homeowner can work by the pool in a personal oasis. 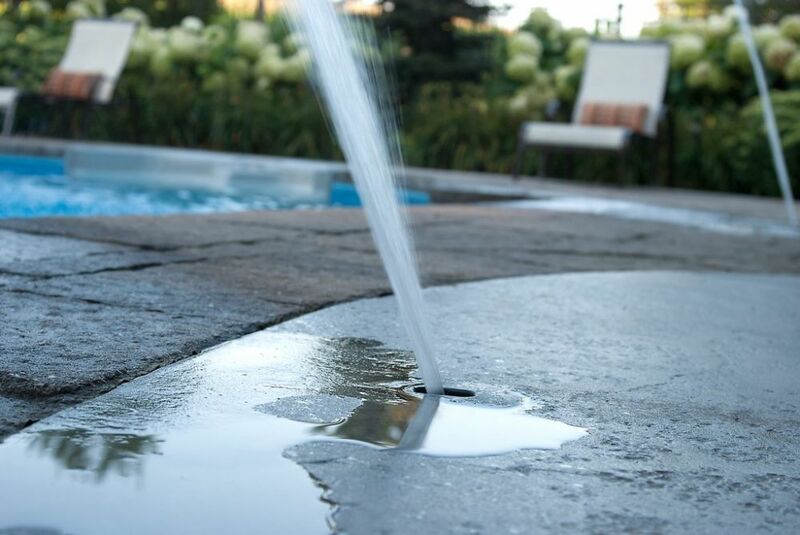 We started our business, Ian McGregor Pools & Landscapes (Ancaster, Ontario, Canada) at about the time the trend toward “taking the indoors outside” began. 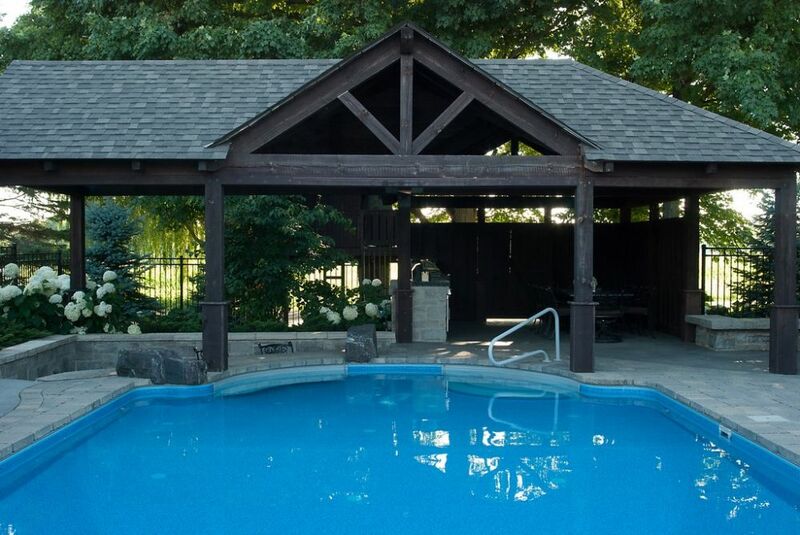 Until around 2000, we focused our energies on the landscape side of the picture, but 16 years ago we saw an opportunity in offering prospective clients the complete package, so we added swimming pools, spas and more to whatever else we might bring to their backyards. We did so because we could see how frustrated homeowners would get when there was no continuity in what was happening on site: With multiple contractors trying to juggle time, materials and crews, there were often delays, miscommunications and the kinds of hiccups nobody wants to experience. As a one-stop shop, we’ve eliminated most of the logistical stresses, taking control and delivering results that meet and exceed our clients’ expectations. Here’s a look at how one such project came together – and beautifully, I might add. 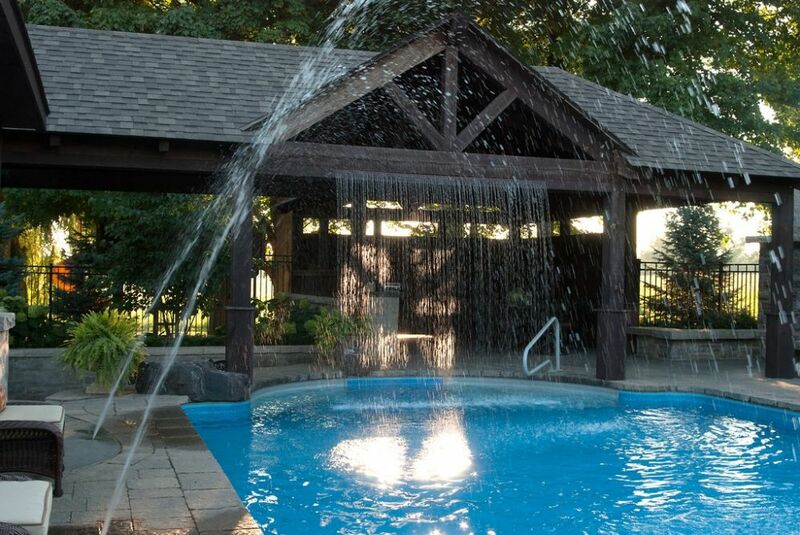 The pool – a 19-by-35-foot, double-Roman-end package from Fox Pool Corp. (York, Pa.) – is set near a shade pavilion that contains an outdoor kitchen as well as dining and living areas. 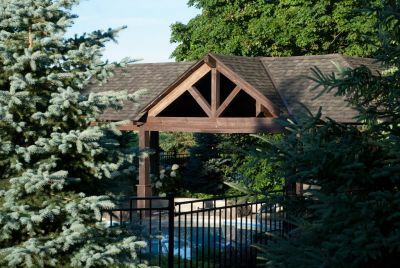 There’s also a swim-up bar linked spatially to a separate lounging area the same covered pavilion, with the whole shade structure built using 10-by-10-inch rough pine beams fastened together with wooden dowels and stained a chocolate-brown color. The pool also includes a number of areas that encourage cross-talk and socializing between people in the pool and those in the surrounding spaces. Opposite the pavilion, for instance, there’s a “buddy seat,” and there are also interior steps and an interior bench – all of which allow bathers to sit and chat or closely monitor children from within the pool in both the deep and shallow ends. The ladder and steps are placed on the pavilion end of the pool to allow for easy movement from the deck and seating areas to the pool – as well as ready access to the pool house and its changing room and lavatory. 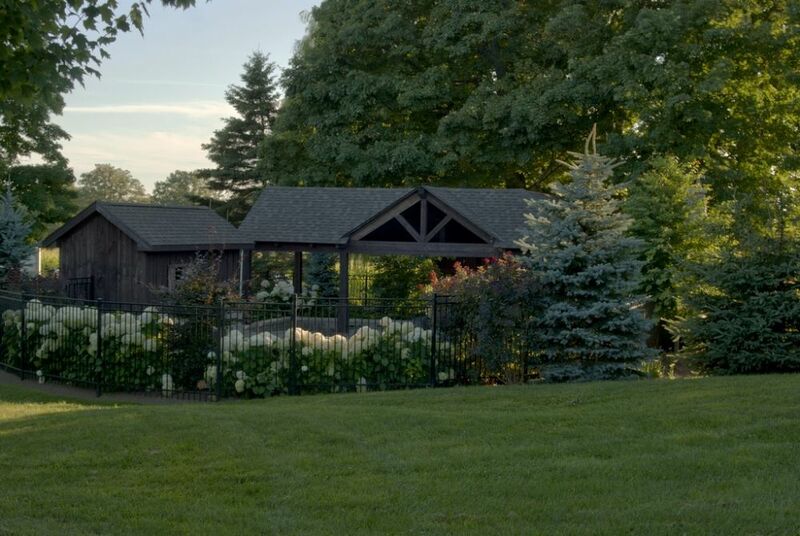 For its part, the pool house doubles as a casual office space, with the abovementioned wifi and computer connections. The wood tones and stone skirting around the bottom third of this structure matches the finishes used in the pavilion, linking them together aesthetically. MAKING ROOMS: Creating distinct outdoor rooms has been at the core of exterior design for many years now, and this project reflects that philosophy all around a swimming pool that serves as an outdoor rec room, complete with a cozy in-pool seating area covered by an umbrella (top left). Moving through the space, we see a pool house that doubles as an office (top middle left); a big fireplace with built-in U-shaped seating (middle right); an outdoor dining room adjacent to an outdoor kitchen (right). There’s also a reversed-style swim-up bar, with a bench in the pool lined up opposite bar-style seating (bottom left). Most of these rooms are covered by a large, timber-framed pavilion (bottom right). 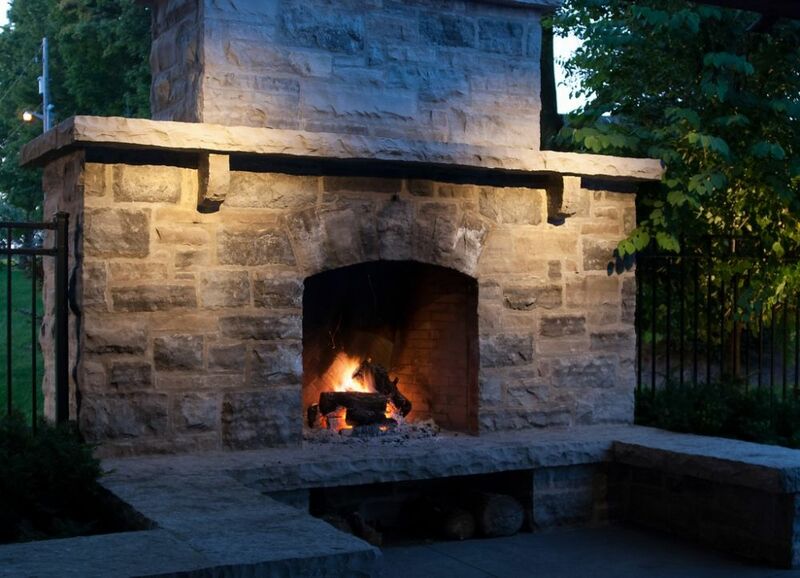 The outdoor living room in this project abuts a big, 15-foot outdoor fireplace that stands right next to the outdoor dining room in the covered pavilion. The fireplace has built-in, U-shaped seating area that allows users to move close to the warmth after meals without needing to move furniture. 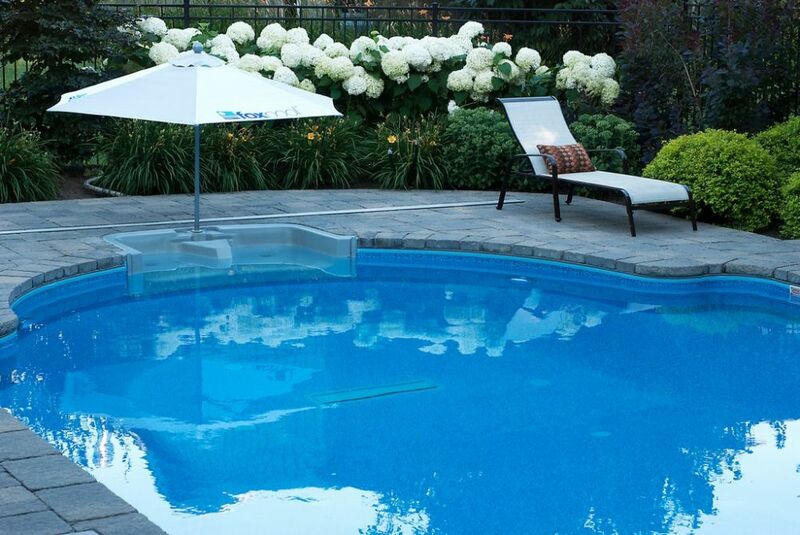 In addition, this heated space is easily accessed by swimmers who might feel chilled on cooler afternoons and evenings. The fireplace itself is constructed using a stone material also found in the kitchen/bar area. Both the kitchen and dining spaces are set under a full-shade pavilion that reaches out over the pool – perfect on both sunny and rainy days. To integrate this area directly with the water, we set up a custom, eight-foot-long rain feature that drops from the roof of the pavilion directly into the step area in one of the Roman ends. There were some challenges here with aesthetics: We didn’t want the mechanism for the rain curtain to intrude upon the visual flow. With help from engineers at Fox Pool Corp. and the folks at Pentair (Sanford, N.C.), we worked out the correct balances for equipment and functionality and figured out ways to camouflage the components within the structure (while still allowing, of course, for serviceability). As mentioned above, the rain curtain is suspended over the pool, giving bathers the experience of walking through a veil of water as they enter or leave the pool. The drop is about eight-and-a-half feet, which creates a soothing sound and a sort of rainforest ambiance. The engineers tied it all into the pool’s main circulation system – and the same is true of the leaping jets we placed in the pool’s deck. There’s a bench in the bar area that’s close to the rain curtain, enabling bathers to soak up the sights and sounds. There’s also the buddy seat on the opposite end that includes an umbrella stand. All of these features are meant to turn the pool into an outdoor rec room – a space for play, socializing, relaxation and good times. Courtesy of Pentair, all of these systems – waterfeatures and lighting as well as the pumps and the heater – can be controlled via a smrtphone. While working on complete outdoor living spaces like this one is more complicated than being the contractor of the swimming pool component or the outdoor kitchen or just the landscape, we’ve found that the control this higher level of participation gives us has simplified our projects dramatically. It’s more straightforward, for instance, when our preliminary client interviews take in the entire environment: The sense of integration starts to grow immediately, and we’ve found that it’s actually easier for our client to think in terms of a bigger, full-featured picture rather than about this or that disjointed facet of the final product. 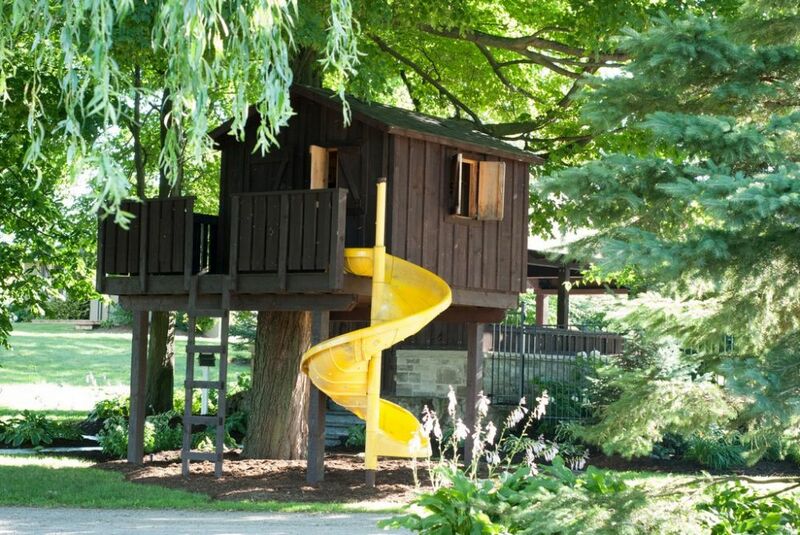 GRANDER SPACES: The overall pool area is just a portion of the property’s large backyard, woven into a space surrounded by landscaping (left) and access points (middle left) and complemented in outdoor-recreation terms by a large treehouse (middle right). The solid presence of the pavilion and fireplace give the whole area the look of an old cabin set in the woods (right). We begin the process of exterior design by starting indoors and considering ways in which the outdoors can become an extension of what we see – and, as important, an integrated part of spaces they already use and like. Yes, it’s about getting them to discuss wants and needs, but it’s also about observing the way they live indoors and figuring out ways we can move their lifestyle choices out into the backyard. A questionnaire is a big source of information for us, as it is for many design-oriented firms. If there’s a distinction in the way we work, however, it’s that we encourage our clients to take their time in responding – several weeks, if that’ what works best for them. We really want them to ponder their answers and discuss things between or among themselves. As a pool builder, I work with all sorts of materials and approaches, from cast concrete to vinyl-liner pools. We select which approach to use based on the clients, the budget and a variety of factors related to the setting. I’m happy these days that package-pool manufacturers are catching up to concrete pools when it comes to design potential. The availability of interior steps, various bench options, liner detailing and a gradual closing of a perceived “aesthetics gap” have made it much easier for watershape designers to consider these systems for their clients and backyards. In the project discussed in the accompanying text, for instance, the staff at Fox Pool Corp. (York, Pa.) played a helpful role not only by offering interior features that made the pool meet client needs and expectations for sociable entertaining, but went above and beyond by helping us figure out details of the swim-up bar and how to integrate the rain curtain and leaping jets into the overall system in ways that didn’t intrude on visual continuity we were pursuing. This adds depth to the basics: How do you plan to use the space? Who will be using it? Is entertaining guests important, or is it all about private family fun? What direction do you enjoy looking when you are seated in the yard? Is there an area or angle you specifically don’t want to see? Will children be the main users of the space, or will there mostly be adults in the pool and outdoor areas? This framework gets us started in the design process. And it’s all backed up by our in-person interviews, during which we generally spend two hours talking about lifestyles, habits and preferences – with about 15 minutes reserved for discussing the project itself. Armed with all of this information, when I come back and give them my presentation and proposal, we’re all on the same page, usually without need for clarification or further conversation. The best thing about coming to the design process from the green side of the equation is that landscape design has for many years been all about creating “outdoor rooms” – outdoor kitchens, outdoor living rooms, outdoor dining rooms, outdoor dens and play spaces and even outdoor offices. It’s a philosophical approach that’s made it easy for us to view pools and spas as “outdoor rec rooms,” with lounges, benches, swim-up bars, umbrella stands and pool houses as colors on our palette of possibilities. We transition seamlessly from indoors to outdoors by bringing comfort and convenience to watershapes and their surroundings in ways that seemed unthinkable 30 or even 20 years ago. The most challenging part of the project was devising the swim-up bar. It’s not a standard feature with package pools, but it was something that we really wanted to include. To make it work, we stood the usual approach on its head, setting up a bench inside the pool just opposite bar-style seating outside the pool. 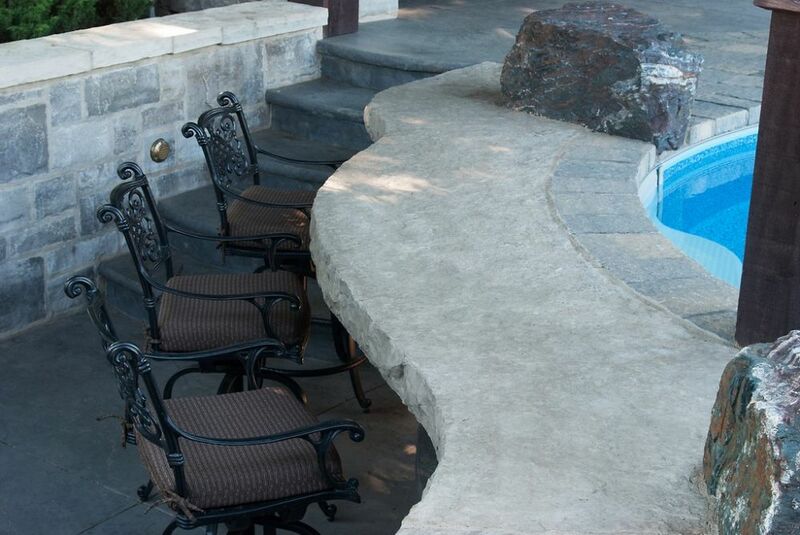 This meant that we had to sink the seating area outside the pool below grade – an unusual approach with package pool wall systems – and worry about drainage issues to an unusual degree. MULTIPLE MOODS: With the pool house doubling as an office, it was important to create a sense of rustic quietude (top left and middle left). But there’s a middle ground that’s reached by turning on the deck jets (middle right) and/or the rain curtain (right): The sound fills the space and can be meditative – or inspires active play for kids of all ages. Serenity, however, is never far away (bottle left), particularly when the sun goes down. This arrangement allows for the degree of sociability the homeowners wanted: People in the seating area and bathers in the pool can meet up, eye to eye, for drinks, food and conversation. Best of all, this arrangement fulfilled the clients’ desire to include a feature that reminded them of happy times spent at swim-up bars in tropical resorts. But the drainage issues this feature brought with it were substantial, because we didn’t want to create a means for water to flow under the liner in the event of a substantial storm. In that light, we over-engineered a bit, creating a reservoir beneath the bar/seating area with an outlet connected to a seepage area well away from the pool. 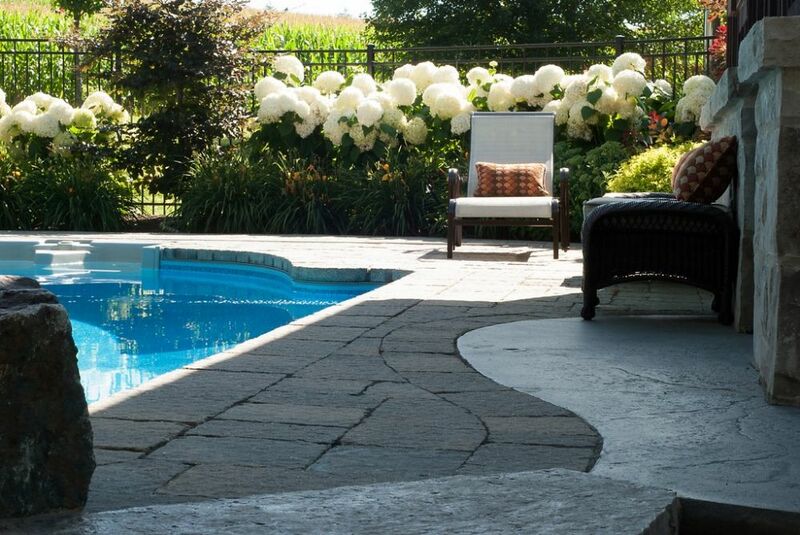 I love the versatility of stamped concrete, but we find that it’s a concern in close proximity to swimming pools and other watershapes because it can get slippery when wet. That’s why, around the pool, we went with an interlocking paver system for slip-resistance and safety, then used stamped concrete in the kitchen/dining/living room spaces because, unlike the porous pavers, the finishes won’t absorb wine or oil or cooking grease as a result of mishaps in the outdoor kitchen or dining area. This and all of the other design elements are part of an overall plan that pays careful attention to scale: The lot was fairly large, but the intention was to create a secluded retreat within it – a cozy space that could comfortably be used year ’round. We packed a lot into this relatively compact space, but it works because we had control of the whole process and were able to integrate finishes and aesthetic touches and make sure that no single “room” and its functions dominated the others. I’m a landscape guy, so plants and lighting play important roles in creating the overall sense of coziness. For their part, the garden areas provide a stunning backdrop through a combination of colors and textures. To provide that color on a steady basis, I selected plants that bloom at various times throughout the year while also paying attention to the foliage – in this case a beautiful combination of green (from Sedum and Hydrangea), lime-green (Spirea), plum-red (Smoke Bush and Barberry), fiery red (Japanese maple) and blue (Spruce). In addition, we selected these plants to harmonize with the stonework, the wooden structures and the wrought-iron fencing – another way to keep things in scale while creating visual appeal. Advances in technology have made the lighting of outdoor spaces a much simpler process. In the past, we’d spend a lot of time worrying about voltage drops with incandescent lights, but with modern LEDs, we were able to include 60 lights that, in the past, would have used 1,000 watts but now use under 100 watts. The key to the lighting program in this landscape was not only providing enough light for safety and usability but also creating layers of lighting to highlight every element of the space. 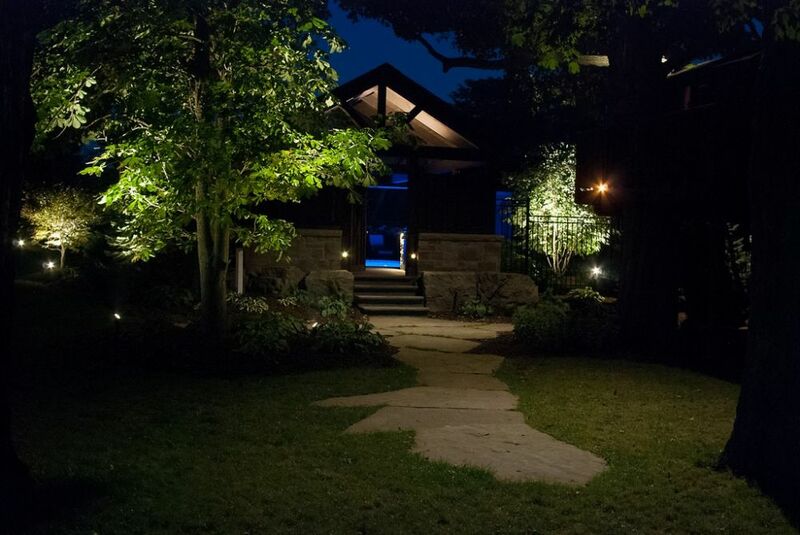 Here, a mix of uplighting, downlighting and some task lighting gives the outdoor spaces a warm, inviting feel. It’s this kind of unified, comprehensive approach that we’ve made our hallmark. To be sure, it means that we have a lot to do by way of keeping up with trends and technologies on an across-the-board basis, but the advantages are such that we’ll never look back – other than to take pride in what we’ve accomplished for our clients. 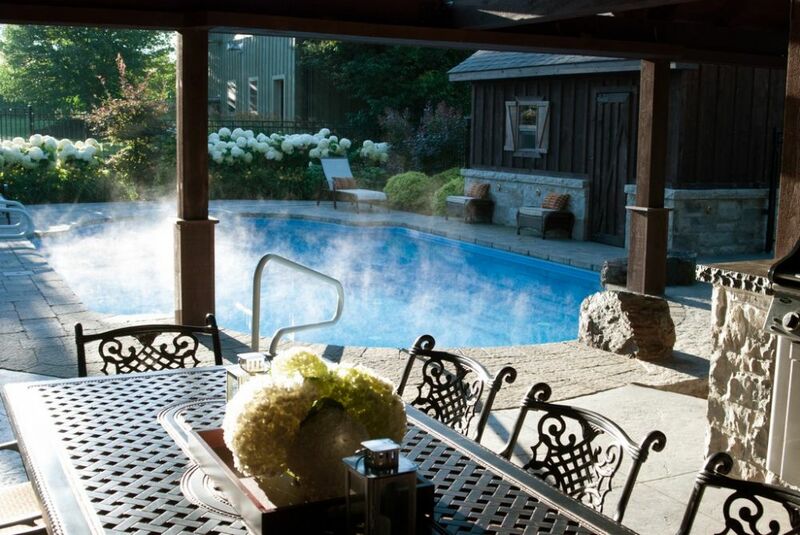 Ian McGregor runs Ian McGregor Pools & Landscapes, a general service pool, landscape and exterior environmental design/build firm based in Ancaster, Ontario, Canada. The company started in the landscape business in the early 1990s, taking on watershapes to complete the services it offered to homeowners in 2000. He may be reached through his web site: www.ianspoolsandscapes.com.